Deck footings: How deep to dig deck footings? How big do you make deck footings? Warning about your deck footings: You MUST, and I mean MUST engage a structural engineer or licensed builder to get the exact size for your deck footings. All ground conditions vary and as such the National Construction Code of Australia (formerly the Building Code of Australia) outlines the different types of soils and the performance requirements for each type of soil conditions. As you can imagine, the performance requirements exist to keep you, your family and friends safe. So many factors come into designing the size of deck footings that there will never be one size fits all deck footing applications. For example, the size of the deck plus whether it has a roof will change the depth of the footing. Also, the soil type will alter the width of the deck footing. For example, say a deck footing is required to be 450mm diameter in stiff soil the footing will likely be increased to 600mm in diameter with soft soils. How deep to dig deck footings? When digging footings, dig down until solid ground is reached (solid ground is the term used to describe where the ground changes consistencies from soft to hard). Solid ground does not necessarily mean digging until you reach rock, however, at times you may reach rock. 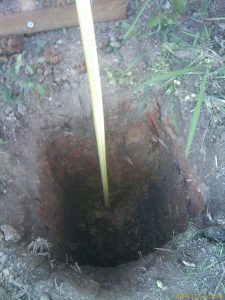 When solid ground is reached, it is recommended to dig an additional 50mm into the solid ground. Regardless of reaching solid ground before a minimum depth of 600mm, the deck footing should be at 600mm deep (always dig bigger, never smaller). If your engineer has specified a minimum depth, you need to dig to that depth. If you reach rock (when I say “rock” I mean a layer of bedrock as described in the National Construction Code, rather than stones as defined in the Webster Dictionary) you need to call the engineer for direction. Deck footings need to be dug a minimum of 50mm into solid ground. How wide to dig deck footings? The best rule of thumb (remembering that an engineer must design your footings) is to have a minimum of 100mm of concrete around your post. If using metal stirrups for timber posts, allow 100mm from the outside of the post, not the stirrup. Metal stirrups keep timber posts out of the concrete footing helping to prevent the timber posts. The stirrups when installed correctly create a 75mm visual termite barrier. Tip: When digging deck footings, I always allow a minimum width of 400mm. Two reasons; first, it’s easier to dig; second, the wider deck footing provides enough room for me to move the post around in the deck footing while maintaining the minimum 100mm clearance around the deck post. Where to position posts in deck footings. FYI: It is best to keep the bottom of all deck footings to the same soil type. For example, if one footing is into rock, you should take all footings down to rock. The reasoning, as the ground moves, the different soil types react differently and push deck footings around differently. This movement will result in your deck being pushed out of shape. Looking for more information about deck footings? Click here.